Flannery O’Kafka! Hurrah! Ms Flannery, the “number randomizer” gods were smiling upon you today….you will be getting this most glorious Wallpaper dress! An extra big big thanks to the fantastic Karen at Misha Lulu for giving us this gorgeous dress to share with our readers! 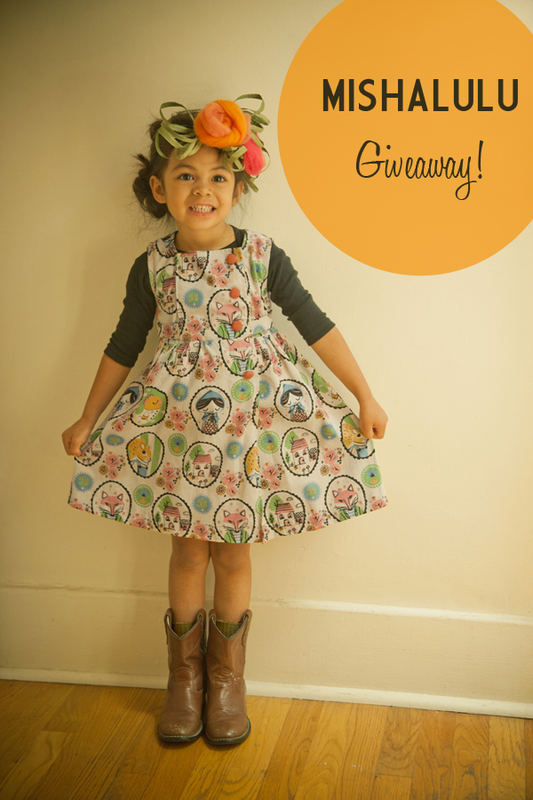 This sweet dress is just the tippy top of all the goodies in Misha Lulu’s gloriously yummy fall line of awesomeness! You must stop by their fabulous site to see everything. They recently redesigned it and it’s stunning. (Keep your eyes open and you’ll see Modern Kiddo fave, Pippi modeling!) You can also swing by the Misha Lulu blog for more goodness as well! Thank you again to everyone who entered the giveaway! We promise you’ll have more chances to win in the future! I’d just about given up on entering any giveaways…I never win and sometimes I’m sorely dissapointed. Oh man, I wanted this so bad. It’s amazing. It’s beautiful. It’s perfect. So excited! Thanks so much to you girls and Mishalulu!! !